Experience Sweden in the best possible way! Earn your master’s degree at the Stockholm School of Economics! • A private business school that receives its funding from private sources; less than 20% of funding comes from the Swedish government. Non-EU/EEA citizens are generally required to pay tuition fees. However, there are some exceptions to this general rule, and we also offer scholarships to some students. Application process: All master’s programs have their own application requirements but the same application deadline, which is January 15 each year. All programs start in August every year. For more information about our programs and the application process and requirements, please visit hhs.se/en/education. The Stockholm School of Economics (SSE) is a private Business school founded in 1909 by the Swedish industry. SSE is of the highest international standards and ranked by Financial Times (2018) as the #1 Business school in the Nordics and one of the leading Business schools in Europe with a unique business community network. Our research is internationally recognized, and many of our researchers are among the leading figures in their respective fields. Our graduates play an important role in the business community, NGOs, culture, and politics and therefore play an important role in the sustainable development of society. The Stockholm School of Economics is conveniently located in the city center of Sweden’s dynamic capital. 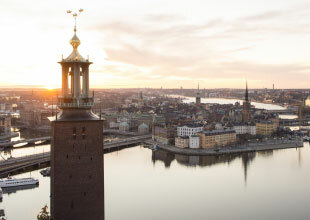 Stockholm is the largest city in Sweden, with a population of 1.8 million, and is often said to be one of the most innovative, sustainable, modern, and open cities in the world. Stockholm is known to pick up fast on international influences. With the city’s broad ethnic spectrum, the latest trends in fashion, culture, art, and music quickly take root. Sweden alsohas a long tradition of being a forward-thinking place when it comes to creating business. The 2017 Bloomberg Innovation Index has ranked Sweden the second-most innovative economy in the world. Successful companies as diverse as Spotify, Ikea, H&M, Ericsson, Volvo, and Absolut Vodka all got their start here. Stockholm is an international city where English is spoken everywhere. Learning at SSE takes many forms: lectures and seminars; problem sets in microeconomics, finance, or accounting; and group discussions on leaders’ dilemmas, market conditions, or why organizations exist. What students learn at SSE also varies. Theory, practice, and skills are all key outcomes of a solid business education, but all are incomplete without reflection. And reflection on why we learn and what we make of the things we learn is at the heart of teaching and learning at SSE. Our programs are developed in close cooperation with the business and research communities, which helps students acquire relevant skills that are in demand. Students work on cases and problems taken from real life. Our close ties to business and our more than 100 corporate partners provide plenty of opportunities to make valuable connections. We offer five two-year master’s programs and one three-year bachelor’s program in Retail Management, all taught in English. Our bachelor’s program in Retail Management is specialized in retailing while also containing the same content students normally receive at all business schools, including economics, marketing, accounting, management, strategy, etc. Many courses are adjusted to give both general content and retail-specific content. The student life at SSE is very active, and the student association is a big part of that. The mission of the association is to promote friendship and make students’ time at SSE stimulating, memorable, and fun. Students can tailor their time at SSE to their own interests or discover something entirely new. They can explore SSE’s exciting student life, experience a wide range of student clubs and activities, and build lifelong friendships. Our students and faculty are known for helping and motivating each other and know that you are only as good as those around you. We prepare our students for a career in virtually any field and prepare them to influence society. Most of our graduates choose to be employed, but agrowing number choose to become entrepreneurs. Our graduates start their own companies, become consultants, or start careers at major institutions or corporations. But there are other paths too. Some of our alumni have become the leader for a major political party, the minister of finance, a film director, a writer, the editor-in-chief of Sweden’s leading daily newspaper, and a beloved media personality. Whatever our students focus on, SSE will help them get where they want to go. SSE is one of the favorite stops for recruiting top talent in industry, government, banking, finance, and global consultancies. It’s a mutually beneficial relationship that has been ongoing for over a century. The annual SSE Employment Report proves that it pays off to study at SSE. Ninety-four percent of 2017 graduates from the MSc programs were employed within three months of graduation. Seventy-eight percent found positions before they completed their studies. The remaining 6% include those who chose not to look for a job immediately after graduation. Eighty-three percent of the top 30 Swedish companies on the OMX Stockholm have at least one SSE alumni on their Board of Directors.